Earn $2.72 in Rewards credit. Click to learn more. 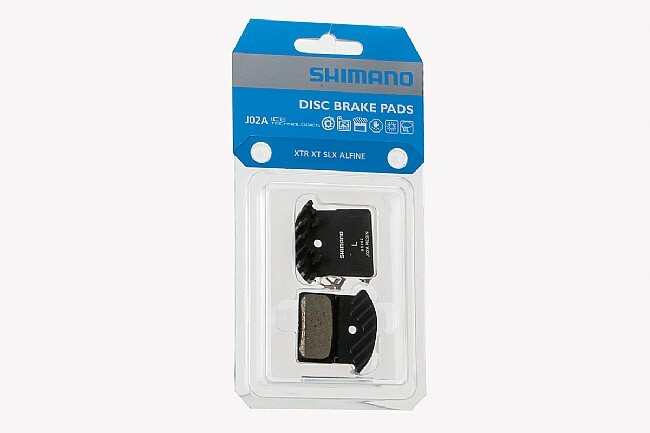 Shimano's J02A XT/ XTR Brake Pad uses a resin pad compound for quieter operation and increased bite in dry conditions when compared to a sintered compound. The steel backing plate uses aluminum cooling fins to reduce brake fade on extended descents. Compatible with the following brakes: XTR BR-M9000, BR-M9020, BR-M985, XT BR-M8000, BR-M785, SLX BR-M666, Alfine BR-S700 and BR-R785, BR-RS785. Sold per brake. Purchase two to complete a pair of brakes.